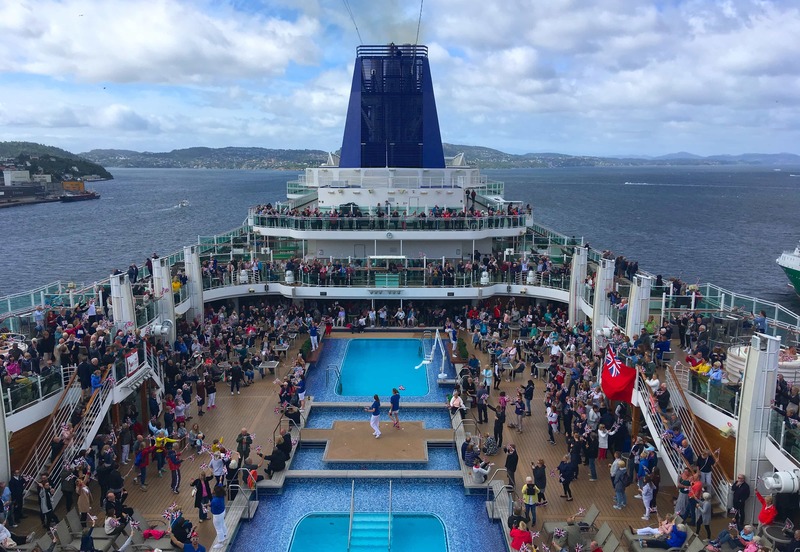 If you are considering a cruise onboard P&O’s Britannia or maybe you’ve already got one booked, this is the post for you. 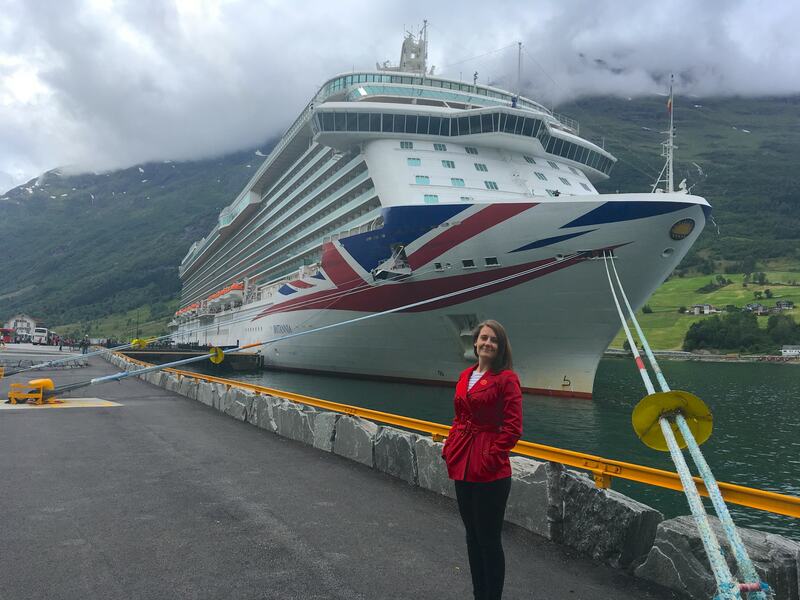 Below are 8 FREE things you MUST do onboard Britannia to make the most of your cruise. I would recommend this one for most cruises but it is even more important on a ship like Britannia. 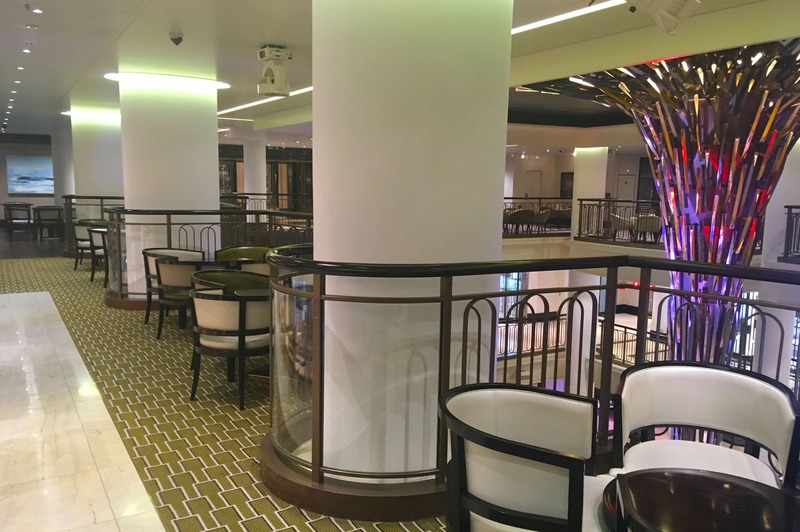 Britannia has a HUGE atrium which spans 3 levels and has various locations where you can sit down and grab a drink. It truly is the heart of the ship and is the best place to sit back and watch the world go by. I would suggest you grab a drink and find one of the comfy blue chairs that remind me of the Graceland guesthouse (very gold and velvet). From there you can get your bearings and work out which way is front and back. HINT: The main staircase is at the front so if you are stood in the atrium feeling confused head to the staircase if you want to go to the front. I found the layout of the Britannia really confusing. It doesn’t take much to confuse me but I don’t think I’m alone with this one! If you get confused just head to the atrium and you’ll be able to get everywhere from there! It’s a full proof plan. 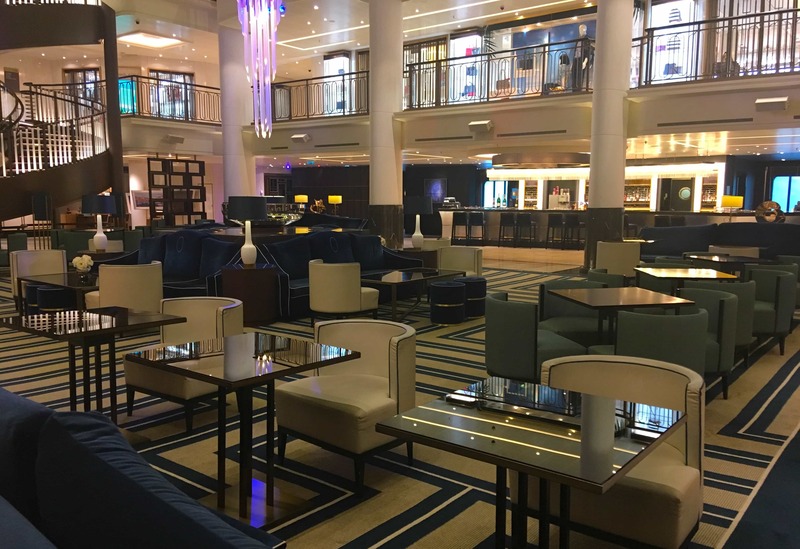 What activities happen in P&O Britannia’s atrium? Most of the time nothing but they do have things here sometimes like fruit carving demonstrations and bed making competitions… yep you heard me correctly! We also bought our drinks package from the atrium on the first day when they have stalls set up to let you know about the drinks packages and speciality restaurants. Some people love table sharing and some hate it. I’ve always avoided it but I did do it onboard Britannia. We had freedom dining which meant that we could show up to the dining room whenever we fancied. Perfect! We shared a table with 8 people and we got on so well that we decided to meet up again on the last night of our cruise. 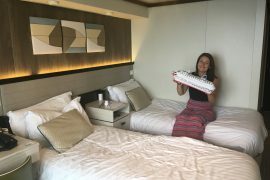 Do you have to table share on P&O cruises? No, you don’t HAVE to. We selected anytime dining and often had a table for two. If you book the cheaper ‘select’ fair you have less priority when it comes to dining although I’ve never found anybody who was unhappy with the dining arrangements that they were given. You can request a table for 2 at the time of booking. Even if you are hesitant about table sharing I would recommend you try it at least once. 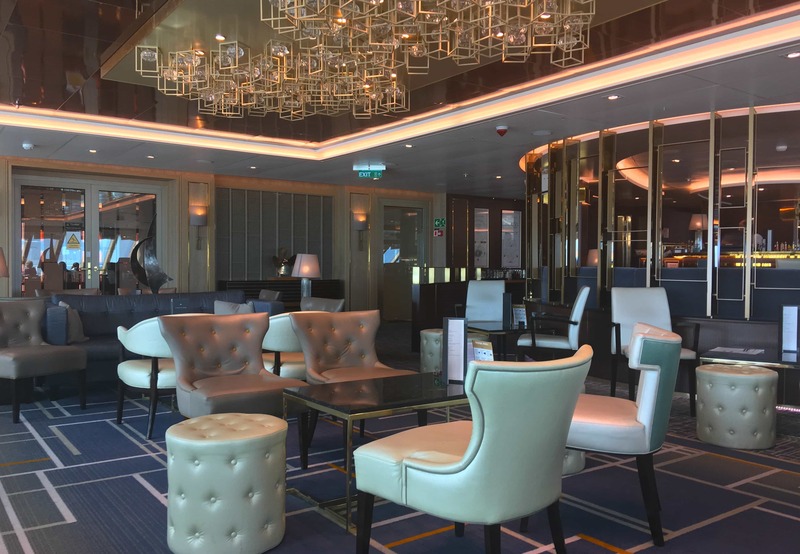 To learn more about the dining options available onboard Britannia click here: P&O Cruises Website – Food and Dining. 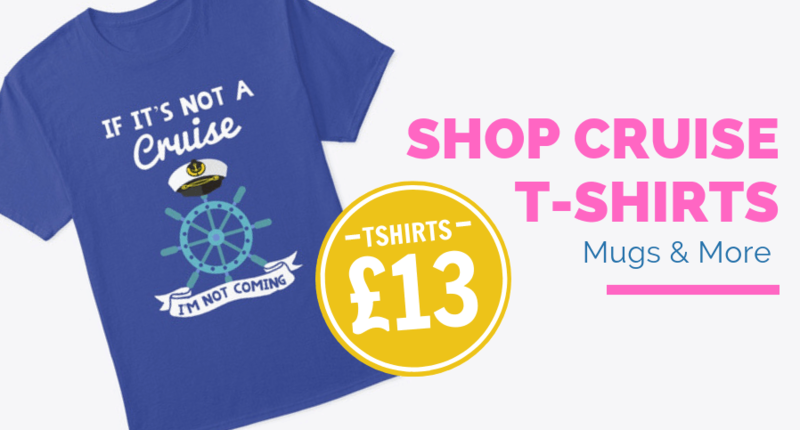 Do P&O Cruises have Formal nights? 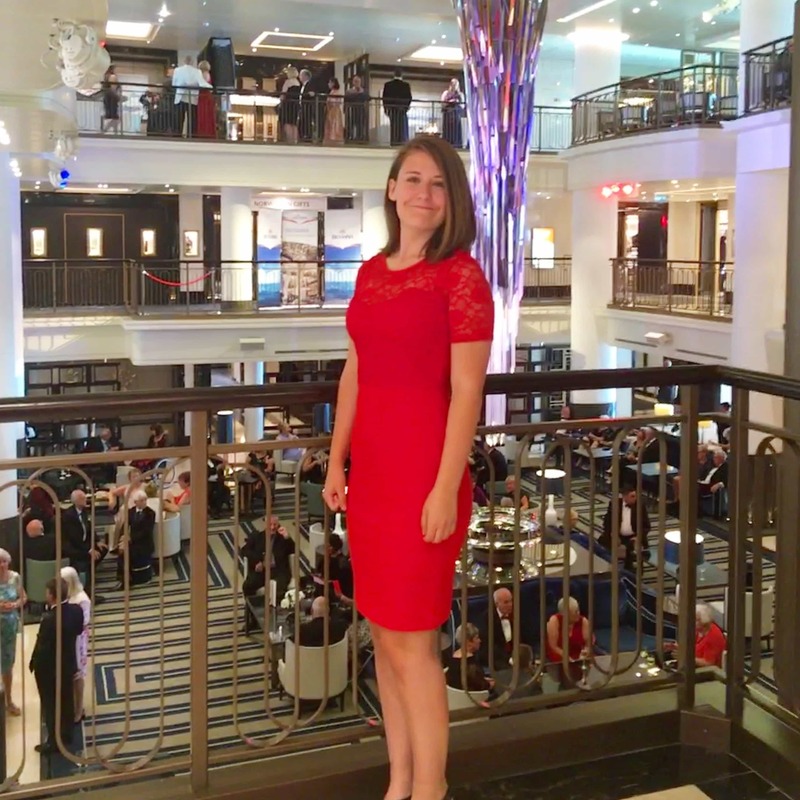 I will be writing more about this at a later date but I was seriously impressed with the formal nights onboard Britannia. 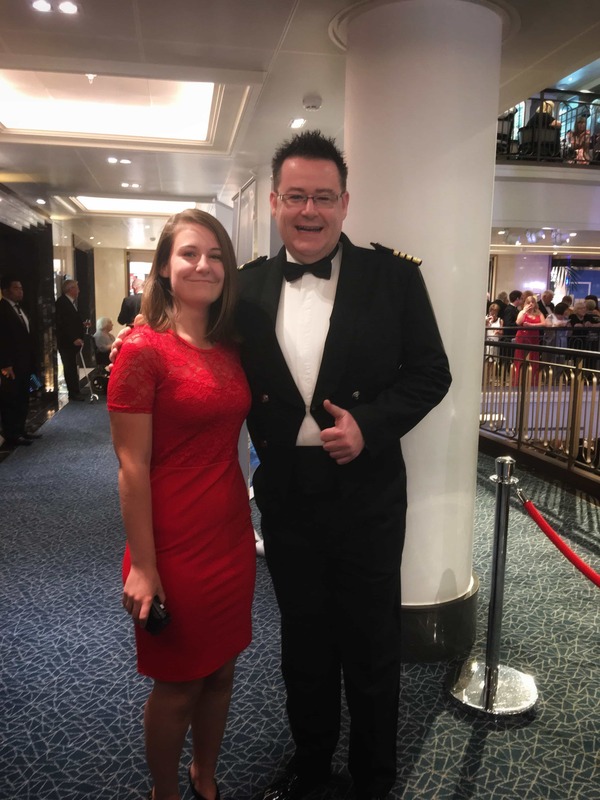 P&O really provides a good opportunity to try formal nights without strictly enforced ship-wide dress codes. Most other guests did dress up and I loved seeing some of the other passenger’s outfits! There are plenty of other dining venues if you don’t want to do the formal dining thing. I thought that the quality of the food was REALLY good. At no point could I find fault with anything in any venue. I will be bringing you a full food review with loads of pictures so please keep your eyes peeled for that one. 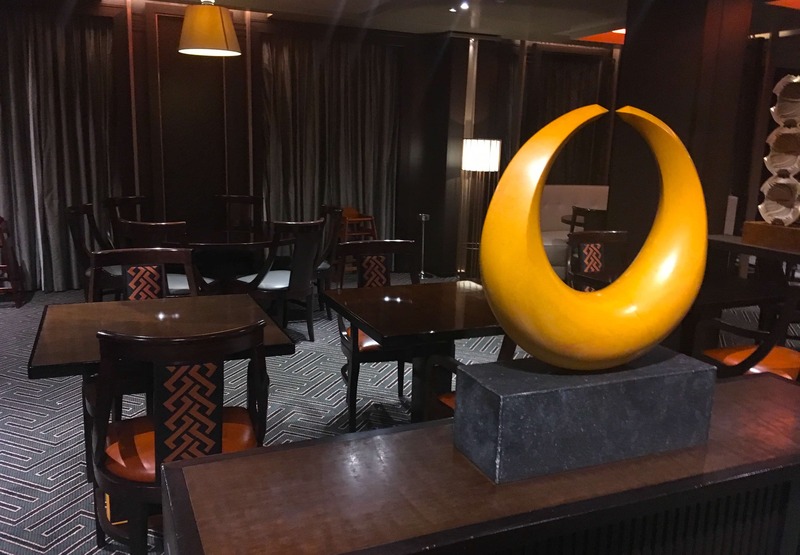 We used freedom dining and it worked really well for us. Below is a photo of lunch in the main dining room. Don’t miss the captains welcome drinks in the atrium! If nothing else you’ll get a free glass of wine or prosecco. Who doesn’t love that? We were lucky enough to have captain Wesley Dunlop onboard who is hands down my favourite cruise ship captain. I don’t really care for meeting the captain normally but Wesley is brilliant. At the welcome drinks the captain will let you know all about your cruise route and the weather to be expected. Wesley joked that “It’s going to be 24 degrees tomorrow… 12 in the morning and 12 in the afternoon!’. That was about right, we had rain every single day of out Norwegian Fjord cruise. Not what you’d expect from June really but Norway is notoriously wet. 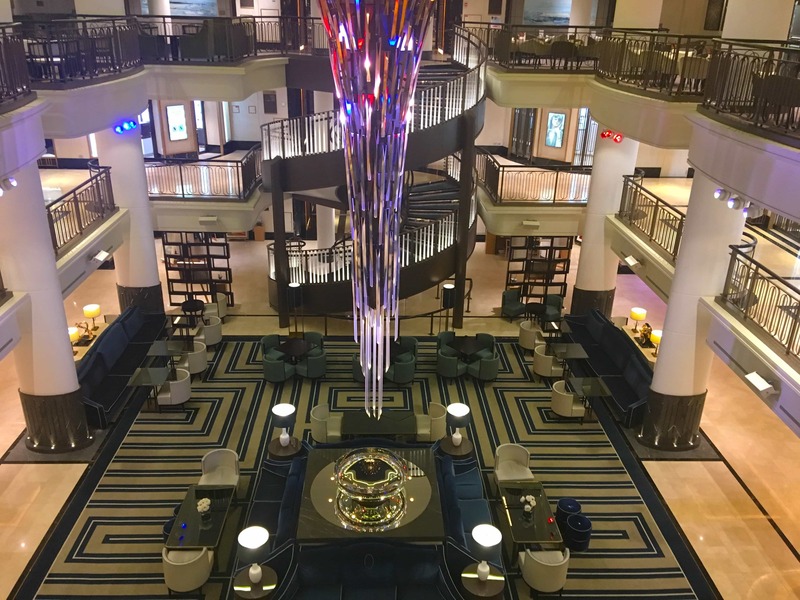 4 – P&O Britannia’s crows nest! 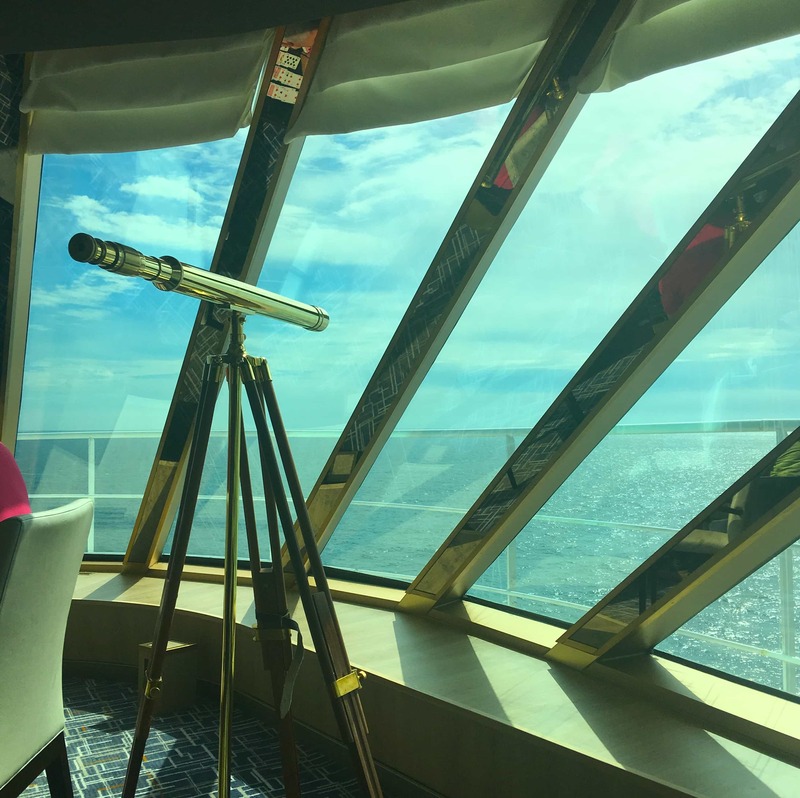 The crows nest is located at the front of the ship and is THE best place to watch a sail in or sail away. It does get very busy as some people tend to ‘set up camp’ here and stay all day. 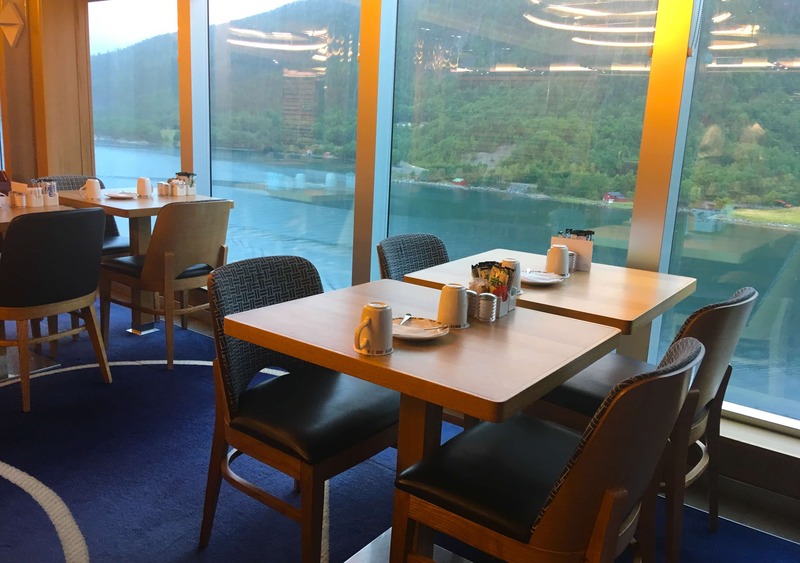 We would sometimes start at the bar and then graduate towards the view as more seats became available… I imagine that the crows nest would be even more invaluable if you were staying in an inside cabin. During our cruise it did rain a lot so the top decks weren’t really an option for watching many of the sail ins/outs. The Norwegian Fjords have some of the most amazing views that I have ever seen so make sure you grab a good seat! Make sure you head to the buffet. Even if you are not a ‘buffet person’ make sure you stop by for a snack. They have iced buns for breakfast and Yorkshire puddings for lunch. That is my DREAM. The buffet itself is absolutely huge and although it did get busy we never had any trouble getting a seat. The buffet is also open for snacks UNTIL 2 am. 2 am!! 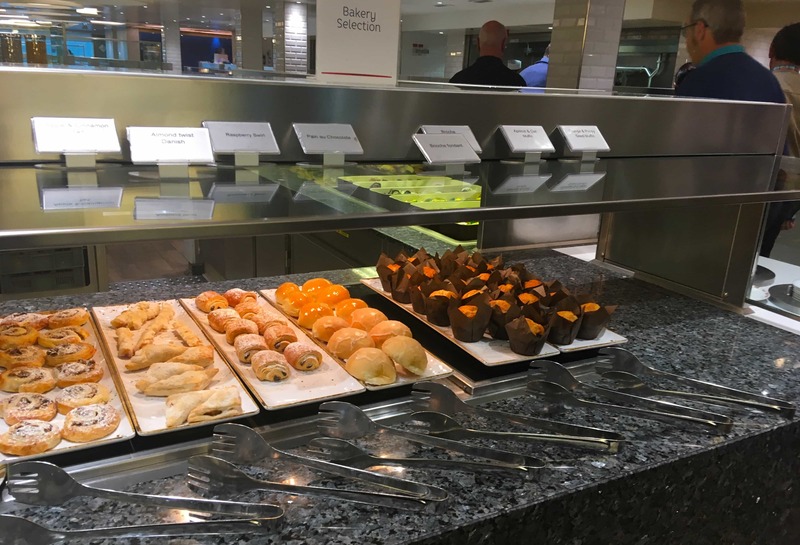 The ‘special diets’ corner of the buffet was really impressive, they have gluten free, dairy free and sometimes vegan options. I can’t eat dairy but I managed to find myself an amazing pudding which definitely competed with my mums dairy version. I will be bringing you a full food review so watch this place! 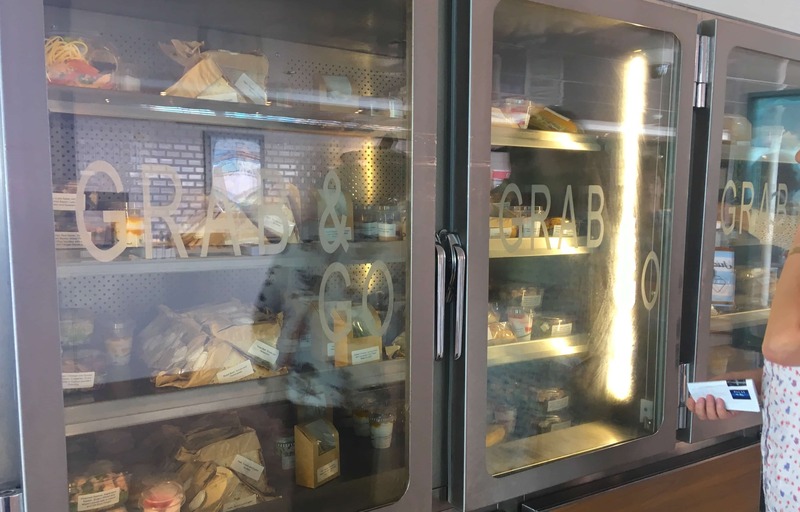 I’m not sure if this is a new feature because I’ve never heard it mentioned before… Up by the pool deck they have a couple of ‘grab and go’ fridges. They have a variety of sandwiches/wraps and puddings/fruits available for you to take away. Think about it like a boots meal deal, but free! I would definitely recommend you head to the top decks at some point and pick up a sandwich to enjoy. It’s a great alternative to the buffet if you don’t want to fight the crowds at busy times. Head to the theatre as much as you can. I usually like to go each evening but unfortunately, there was so much to do onboard Britannia that we probably only made it about half the time. The quality of the productions and singers was really good. My personal favourite was the ‘4 tunes’ who are a four piece male group. The singers all have a musical theatre background and sung a variety of songs. My only complaint about the theatre is that you can only get into the rows from one side. So if you’re on the edge you’d have to walk past a lot of people to get out. I like to have escape routes! 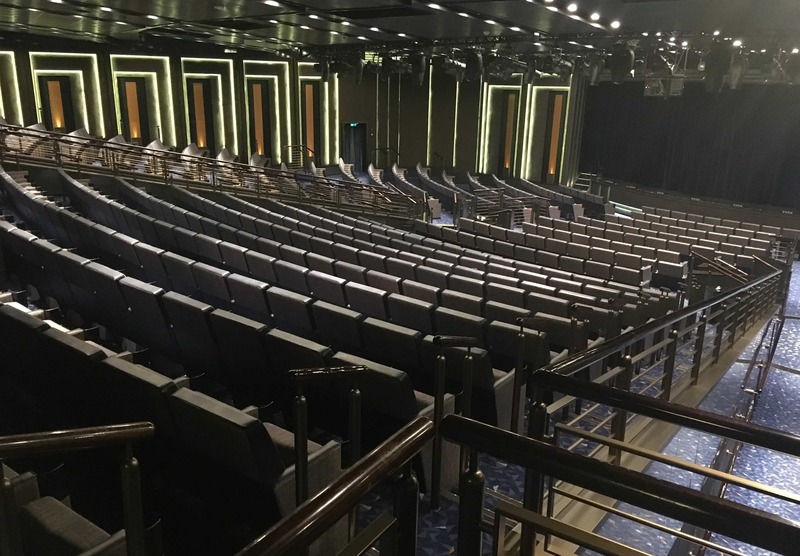 To learn more about the entertainment available on Britannia click here: P&O Cruises Website – Entertainment. There is a lot of hype about the show ‘Astonishing’ at the moment and rightly so! It is a magic/singing/dancing show produced by Stephen Mulhern and Jonny Wilkes. 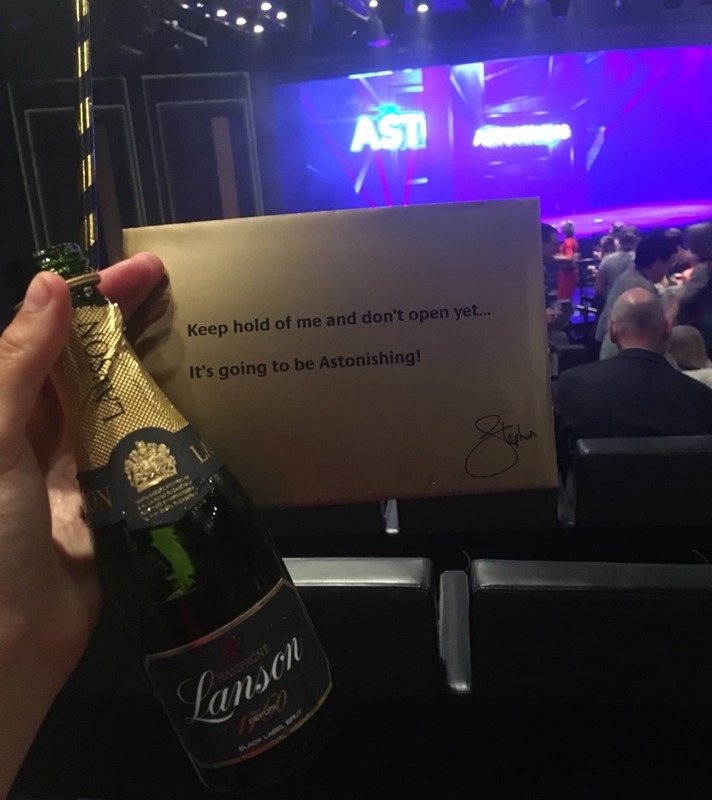 We were onboard for the premiere of the show where they gave us lots of champagne before the showing. We went back later in the cruise to watch the show again and it was really interesting to see it again when not under the influence of champagne… it was still really good but definitely different. Astonishing had a good mix of magic, singing and dancing which I appreciated. I have a very short attention span but i was entertained for the full 45 minutes. 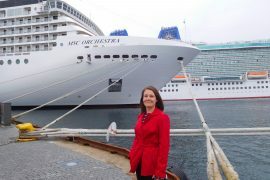 8 – P&O sail away party! 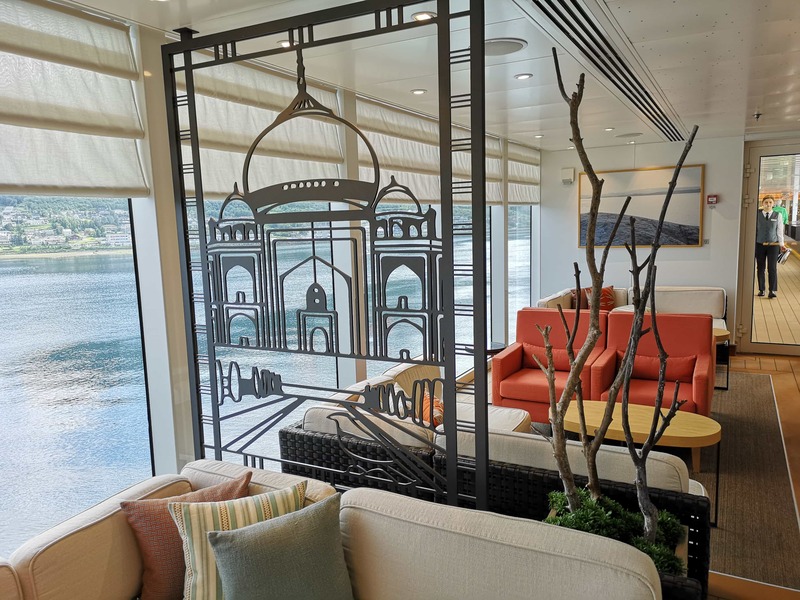 The sail away parties onboard P&O are not to be missed. I have never seen quite like it before. You’re all given a flag and they play british pop tunes. Everybody gets up and has a dance and it’s loads of fun. Very very cheesy but I enjoy that. Some passengers had obviously bought clothes for the occasion. One man had a full union jack suit! These ones are things that I think would massively add to your cruise if you can but of course, I understand they aren’t for everybody! 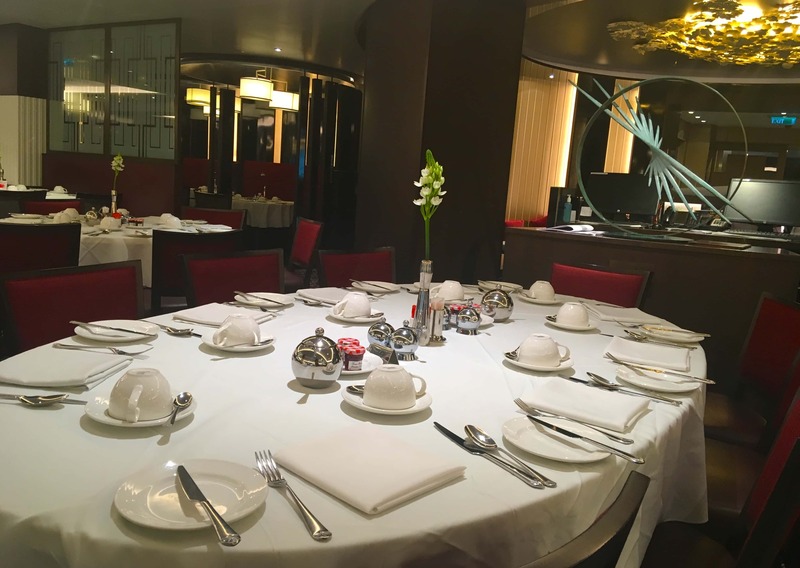 Onboard Britannia I tried out: Epicurean, Sindhu, the Beach House and the Limelight club. I usually don’t try out speciality restaurants but I’m glad I did. Each one provides a unique experience. 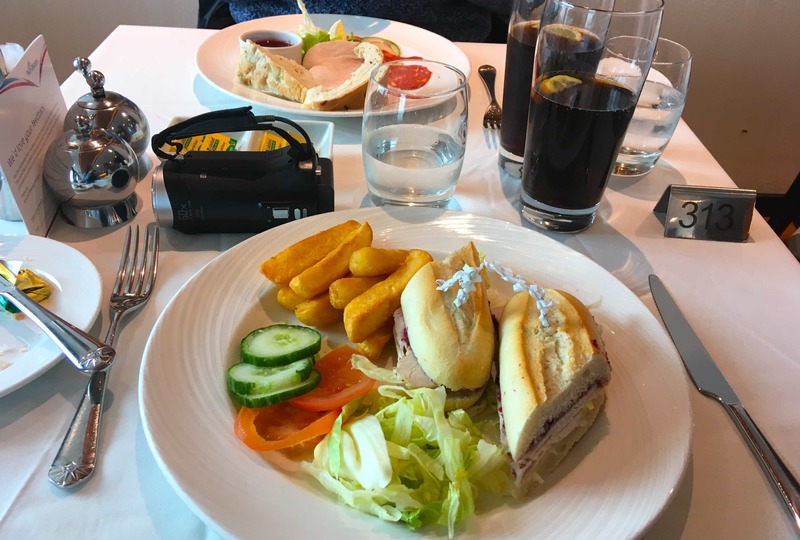 I didn’t necessarily think that the food was any better than in the main dining room (it was really good in the main dining room) but each one had very different food. 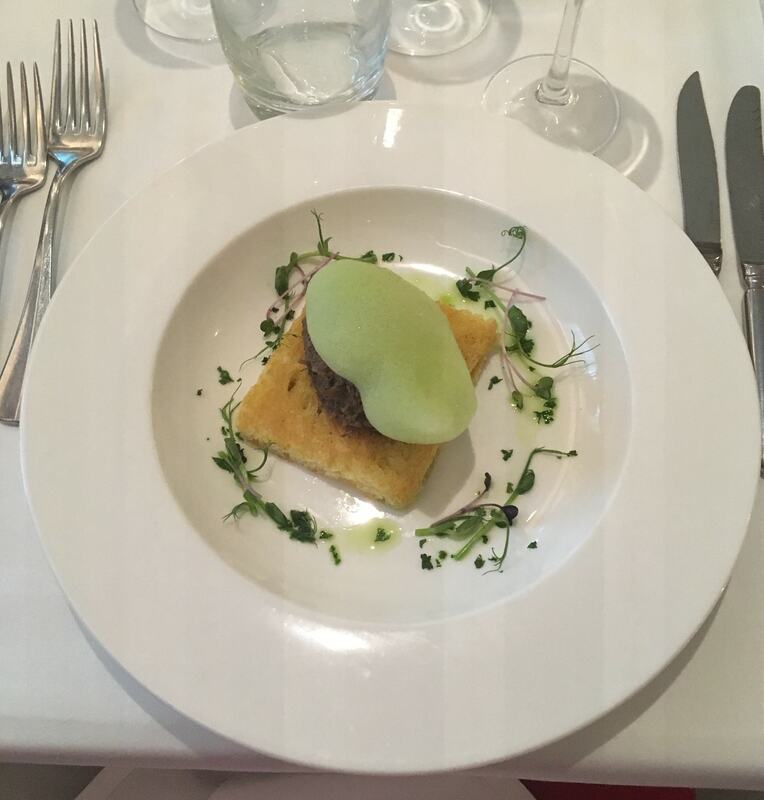 Epicurean was more of an experience than a meal. Everything was very theatrical and I had some ‘parsley bubbles’. At one point we were given a pipet of gin and this weird jelly eyeball to create some type of food. I have no idea! I am not really a fan of Indian food but I really loved Sindhu. Mums only complaint was that the restaurant was too dark for her to read the menu. Very atmospheric! The beach house is the cheapest (£7.50ish) but it was my favourite! 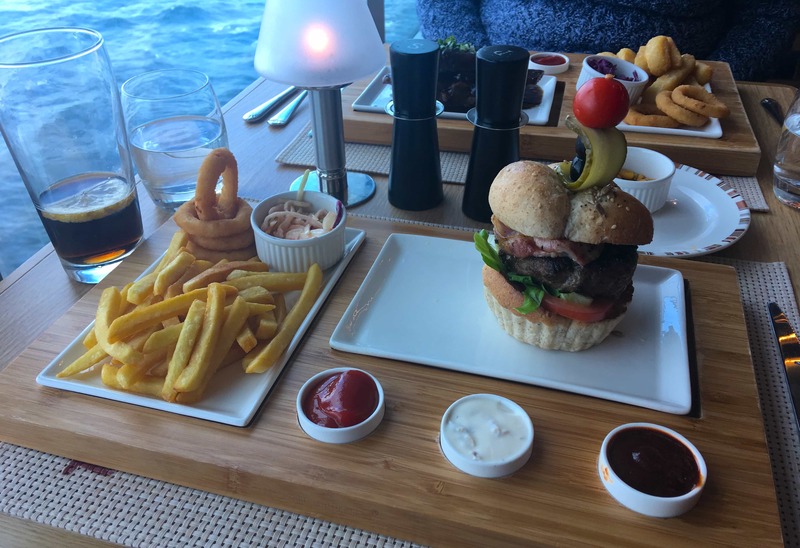 They turn part of the buffet into a restaurant and serve things like burgers and ribs. Mum and I had a chocolate fondue dessert with churros and marshmallows. Yum. The limelight club is a dinner with a show experience. You have your pre-starter, starter, main and then watch a preview performance of whoever you are watching. After this you have dessert and then watch the full show. The food was good although I felt the evening dragged on a little (literally took 4 hours). I am more of a grab and go kinda girl! Okay, this is on the should do list because it is kinda expensive. 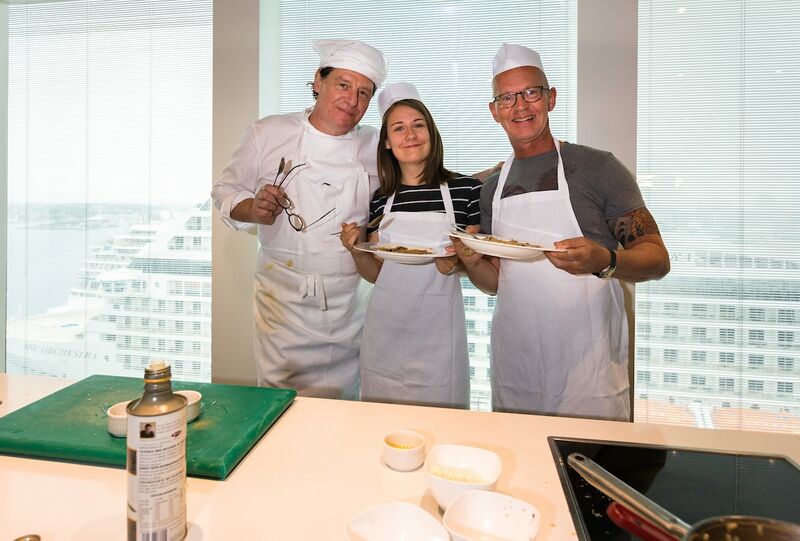 The morning that I spent with Marco Pierre White learning how to cook costs £100. But it was SO much fun and if you have the money I would definitely recommend it. Even if you don’t like cooking (I don’t). 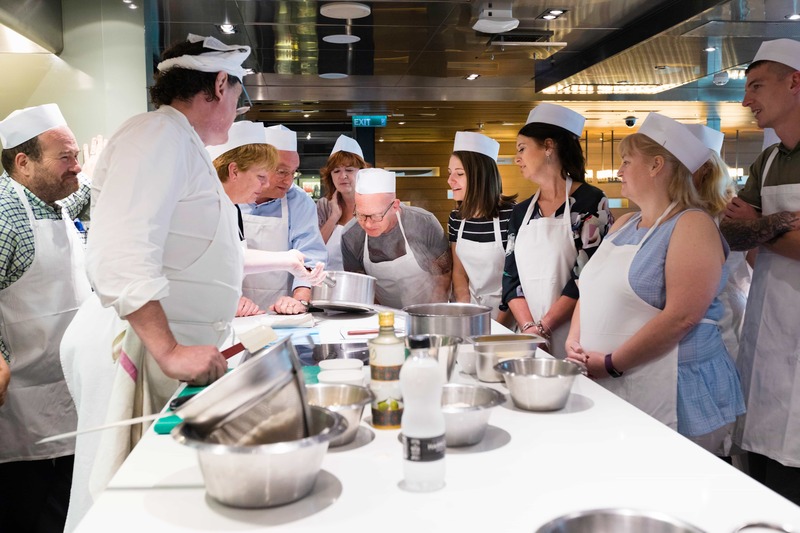 The Cookery Club on board Britannia is a hands-on cooking school at sea. 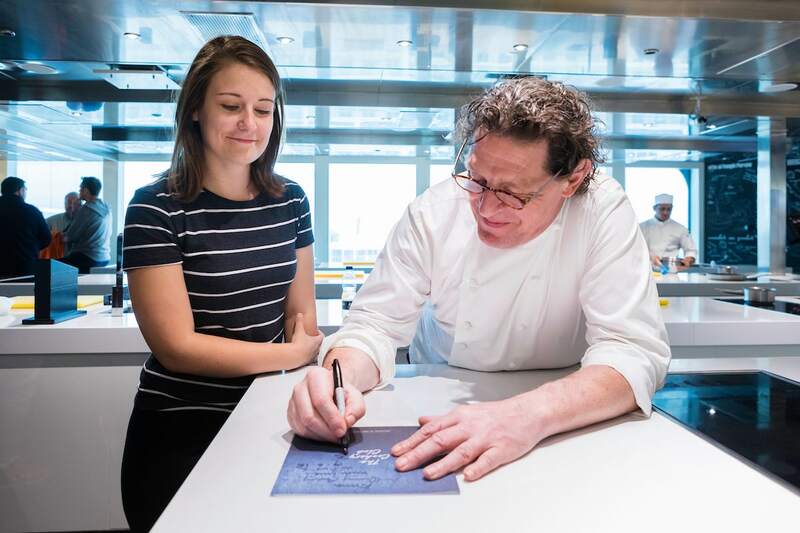 Create your very own culinary masterpieces under the guidance of the best in the business, including the Godfather of British cooking, Marco Pierre White and other Food Heroes (on selected cruises). Are you cruising on Britannia? 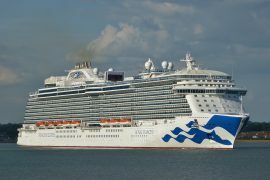 Any cruise ship can be overwhelming and one as big as Britannia can leave you thinking ‘where do I start? 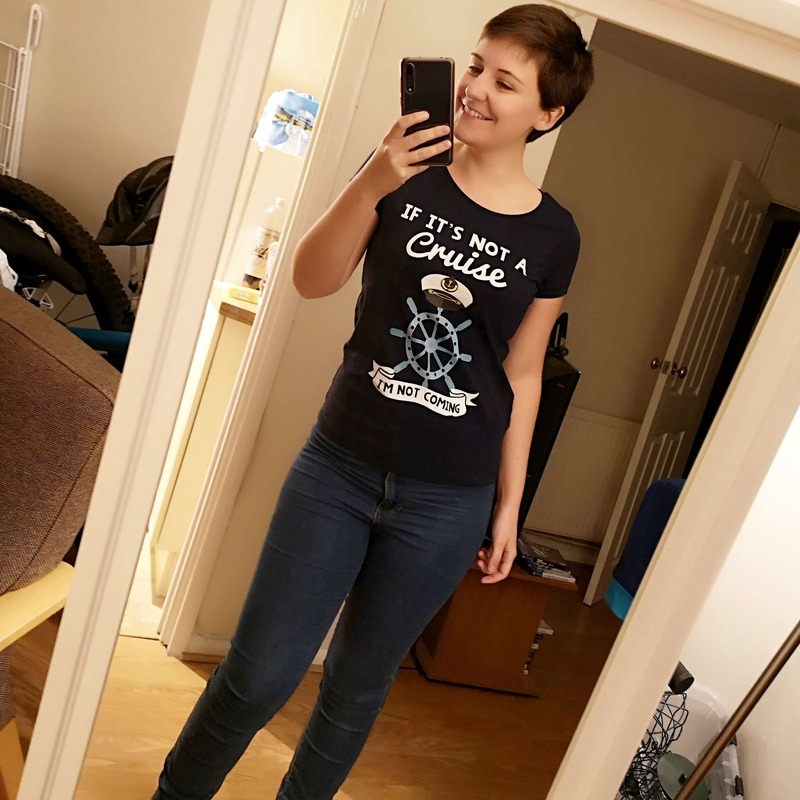 !’ I hope this post gives you some ideas. 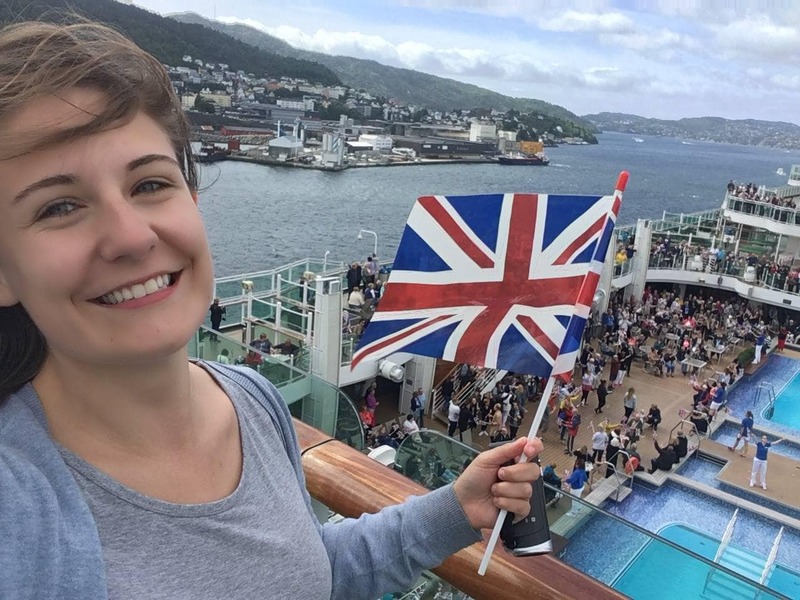 I had the most amazing cruise onboard Britannia as we cruised around the Norwegian Fjords. 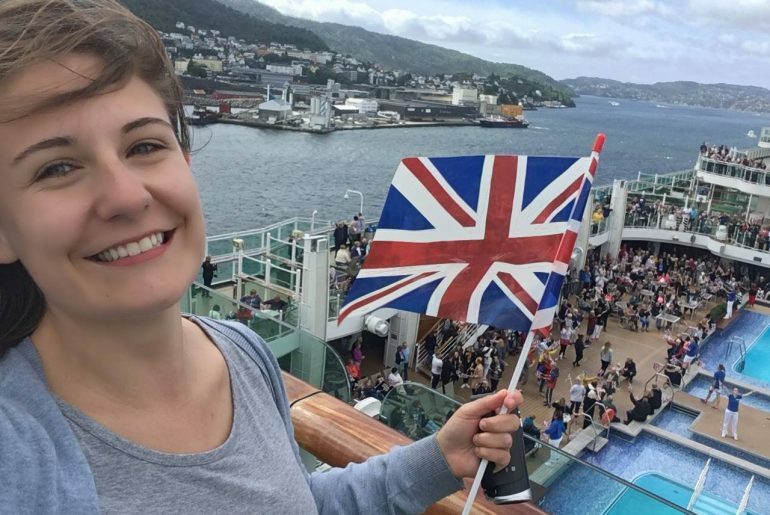 It was my first P&O cruise and I was really impressed with the quality of the food and service onboard. 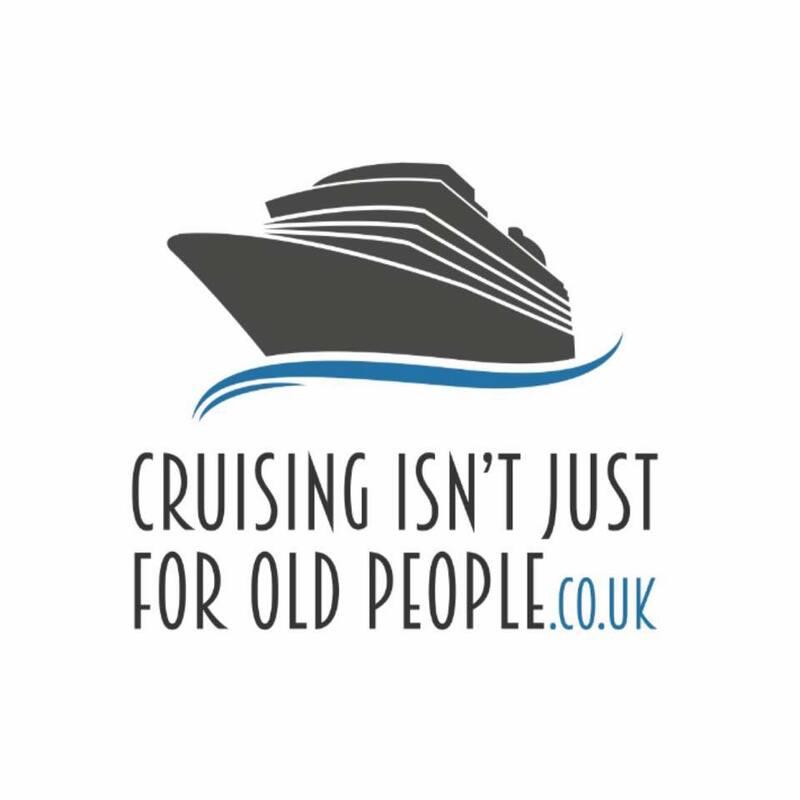 Please leave me a comment letting me know if you’ve cruised with P&O before and if you’ve got any booked where you are going? 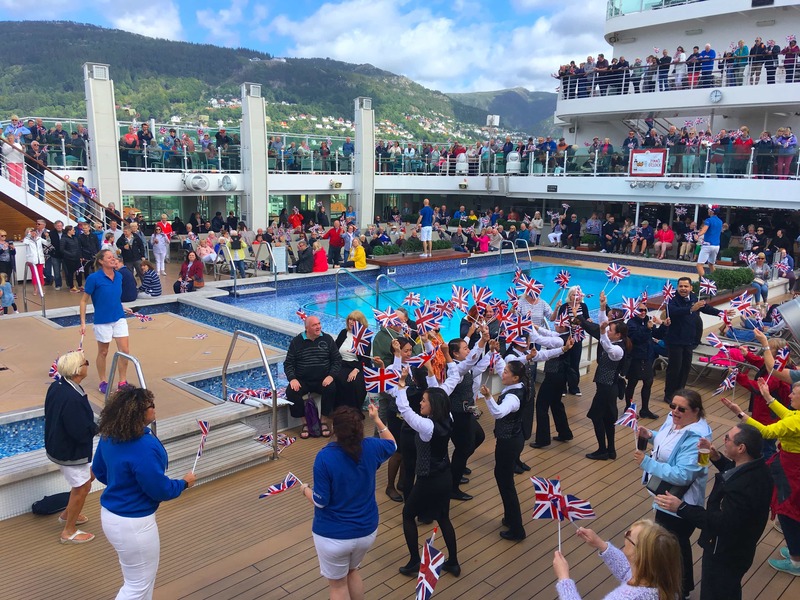 To learn more about Britannia on P&O website click here: Britannia Cruise Ship. If you’re still not convinced by P&O here’s a post for you! 10 reasons to cruise with P&O. This is a brilliant post by a friend of mine Gavin. He has been SO helpful with me taking my first P&O cruise. My go-to man for all things P&O! Found your website today Emma and it has been great source of information. We are cruising the Norwegian Ffords aboard Britannia in a couple of weeks and your tips and videos are a real help. Loved your review Emma. We’re on Britannia in August doing the Fjords and it will be our first cruise with P & O. So excited after reading your blog. Thank you Tracy! You’ll have an amazing time. I am going on Britannia on Sunday. From Southampton to St. Peter port. Then on to Santander and coruna. And then onto La Rochelle in France. I’m so excited. Thank you so much Chris!! Glad you found it useful. Have an amazing time that all sounds amazing. Hey Martin, there are no drinks included they are all charged (apart from tea/water in the buffet). Thank you Emma for sharing this information with us. We’re on her for the first time for seven nights on 1st June. We’ve been on Ventura three times, Azura once and Oriana once.